Should I add commodities to my portfolio? The big debate of the benefits of adding CCF (collateralized commodities futures) funds to a portfolio continues on the Diehards forum (48981). As for myself, I had previously bought PCRIX as part of my Precious Metal / Commodity asset class allocation but decided to eliminate it due to difficulties in re-balancing and performing DCA (PCRIX is a transaction-fee fund at VBS). I replaced it with VGPMX instead. The new ETF DBC sounds interesting but I would defer any consideration until the expense ratio is lowered to at least below 0.8%. 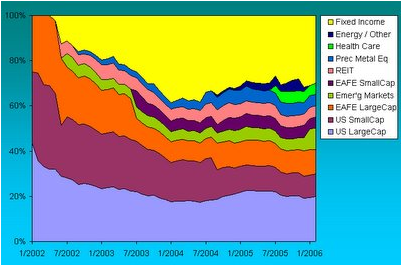 Vanguard Diehard enels today posted (49075) a link to asset classes returns from 1927 to 2005. This is a valuable resource for any future use when I might want to run various portfolio return/risk scenarios. I am saving a copy of the file. Recently, I generated an interesting chart showing how my asset allocation has evolved since 2002. I started out with a 100% equity allocation, being modelled along Larry Swedroe’s two parts of “value” equity to one part of “blend”, and with roughly equal allocations to US large-cap, US small-cap and International equities. Subsequently, I added REIT, emerging markets and precious metal equity asset classes. These asset classes proved to be life-savers for my portfolio. I have also abandoned the 2:1 value to blend ratio to simplify matters and to reduce the number of funds I need to hold. I also used to have about 5% allocation to energy and individual stocks. But with the huge run-up in energy prices last year, I decided to close out the allocation and re-allocate the money. These go mostly into the now enlarged emerging market equity allocation.